We know from 20 years of experience that a Brand Pyramid can transform organizations by clarifying what to focus on and how to talk about themselves. We’ve distilled our experience into this tutorial so that smaller organizations can benefit. Brand strategy doesn’t start with visuals. This tutorial won’t show you how to create a logo. It will help you sort out the fundamentals of who you are and what you want to be known for. This brand strategy tutorial is a proven starting place on the path to a stronger brand. The Brand Strategy Tutorial includes a seven-part video series that explains each level of the Brand Pyramid in detail. With this foundation, you can take full advantage of the three hour-long consulting sessions with Tronvig Group’s founder and president, James Heaton, who has taken over a hundred organizations through this process. You can watch the introduction to the seven-part video series for free right now. If you would prefer to ask us questions directly rather than reading this whole page and FAQ, we’re happy to answer your questions on the phone: (718) 522-6326 (9:00AM to 6:00PM Eastern). Access to 7 brand strategy tutorial videos. There’s an introduction to the Brand Pyramid, a video for each of the five levels of the Brand Pyramid, and an appendix with tips on how to run a successful workshop. Brand Pyramid worksheets. We’ll give you a guide to brainstorming and refining your answer to each of the five questions. 3 hours of consulting time with James Heaton by phone. We’ll answer your questions and prepare you to run your Brand Pyramid workshop. Later, we’ll review your work product and help you refine it. Finally, we’ll help you make the most effective use of your completed Brand Pyramid. Q: Who should use the guided Brand Strategy Tutorial? Organizations (generally with fewer than 30 employees) who are not able to engage with a branding agency for comprehensive strategy services. Tronvig Group’s full offer of 360-branding services is outlined here. Q: What is included in the guided Brand Strategy Tutorial? Access to the seven instructional videos. Three separate guidance calls with Tronvig Group president James Heaton. 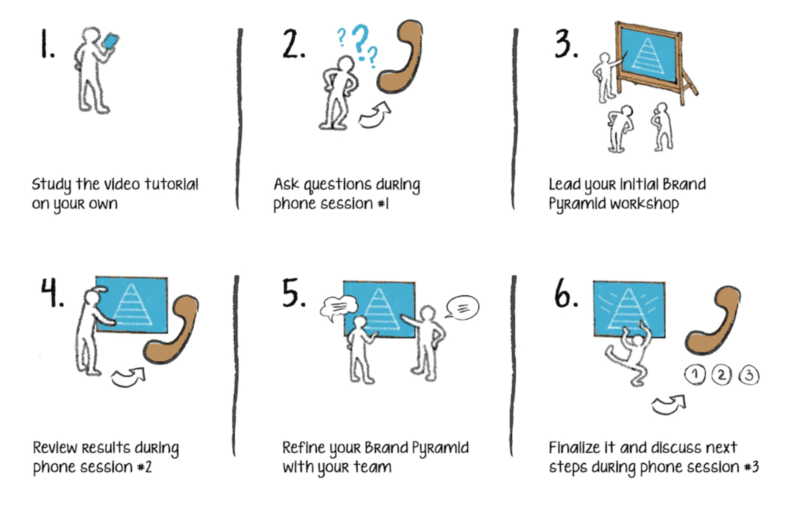 The first call is to answer questions not answered here and to get you ready to run your own Brand Pyramid workshop. The second call is to review the work product. Is your Brand Pyramid complete and sufficiently robust? What still needs to be worked on? What do you need to do to get it finished and ready to use? The third call is to make sure the Brand Pyramid is ready and to help you put it to effective use in your organization, whether in managing your vendors or taking the next step in the brand process. We will look at what we have accomplished, what can be done with the Brand Pyramid, and what still needs to be done. Q: Is there guidance other than the three consulting calls and the videos? There is also an accompanying worksheet for each level of the Brand Pyramid for use in the workshops. These reinforce what’s in the videos and help you shape the answers into their most useful format. The worksheets are designed to be completed during the workshop. Q: What’s the best way to tell whether our organization needs a Brand Pyramid? What is our organization? What business are we in? How do we deliver value and how do we do so differently from our competition? Why does our core customer (client or audience) care about us? If the answers you get are consistent, you don’t need one. If they are divergent, you do. Q: How much of the Tronvig Group process do the videos cover? The videos vary in length but are, in aggregate they are a little more than an hour long. Video 1 (available for free download) is 15 minutes long; it introduces the Brand Pyramid. Videos 2 through 6 provide an in-depth explanation for each of the five levels of the Brand Pyramid. Video 7 shows you some additional thoughts and tips for leading a successful workshop. Q: Who on our team should watch the videos? Only the person who plans to lead the workshops needs to watch all the videos. If others are interested in learning more, they can watch the 15-minute introductory video, which explains the importance of this work and shows a 5-minute excerpt of a live workshop. The configuration of the workshop is highly dependent on the particular situation and the type and size of your organization. This is a key item on the first consulting call. Q: How many people should participate? The minimum number of participants for an effective workshop is 5 (not including the facilitator) and the maximum we have successfully managed was 35; however, the ideal number is between 10 and 20 participants. We will discuss this on your first consulting call. Q: Who on our team should lead the Brand Pyramid workshops? The workshop leader can be either the marketing director, an outside facilitator, or any other person in the organization who is a good facilitator. The leader of an organization should not lead the workshop, but should participate. Q: How long will the process take once we get started? The process can be completed in a week with everything orchestrated perfectly, though typically it takes 4 to 6 weeks to accomplish. Q: How many meetings do we need to schedule, how long should they last, and how far apart should they be? Ideally, there should be two 4-hour workshops, but there are various constraints depending on the organization. This planning topic is a part of the first consulting call. Q: What materials do we need for the workshop? We find that the most constructive setup is to have multiple easels with large sticky-back flip charts. There should be markers to write down the group’s proposed answers and the notes should be torn from the flip charts and stuck to the wall for everyone’s reference. Participants can either have their own worksheets to write down consolidated answers or assign this to a meeting scribe. The printable worksheets are a part of the package, but the large sticky-back flip sheets and easels should be obtained in advance of the meeting. Q: Where should the workshops take place? They should take place in a well-lit space where participants will not be subject to interruption. These can be either on-site or off-site, though there are advantages to doing it at an off-site location. The room should be configured so that everyone can easily see each other and the easels. Tables for the participants can be used but are not necessary. Q: How do I schedule the three phone sessions? One of our team members will reach out to you within a business day after your purchase to coordinate a time for the first consulting call and each additional call as you complete that part of the assignment. Q: Who participates in the three phone sessions? Either the workshop leader or a core team of 2 to 5 people who are responsible for the project’s success. The calls can be by phone or video, as desired. Q: Can the entire team participate in the consulting sessions? Yes. This may not be the most productive use of everyone’s time, but we are certainly happy to hold a phone or video conference call to answer questions from the whole group. Q: Who will we be speaking with during the phone sessions and how long will each session last? Each phone session is one hour and will be led by Tronvig Group founder and president James Heaton. Q: What will we have once we’ve completed the process? To state the obvious first, you will have a Brand Pyramid for your organization. Our third consulting hour will focus on how to make use of it. This is a valuable tool in brand strategy, organizational alignment, employee retention, operations and program assessment, vendor management, and more. The most appropriate applications of your Brand Pyramid will be discussed during our consulting time. But to restate some examples that we outlined in our description of the Brand Strategy Tutorial above, you should understand the Brand Pyramid as a simple diagram on which the most fundamental questions about your organizational brand are clearly answered. You will have developed and agreed upon these answers with all of your colleagues so that you can use them to guide your decision-making. When you have a disagreement, you can turn to the Brand Pyramid for a shared foundation on which to resolve the argument. You have a tool to prevent personal taste from dominating discussions about how your logo, website or advertising campaign should look or what it should emphasize. If you would like to have your Brand Pyramid placed in our design template for digital distribution or printing (with Tronvig Group branding), there is an additional charge of $150. Custom designs, or other augmentations, can be accommodated by request for $150 per hour of design time. Q: I want to purchase and use the guided Brand Strategy Tutorial, but I need help convincing others. Why would this be a good use of our limited resources? First, share the video preview on this page with them and ask them to watch the 15-minute introductory video here. If this is still not enough, we are happy to get on the phone with you and your boss or colleagues to answer any questions. Call us at (718) 522-6326 or email info@tronviggroup.com to arrange this. Q: Must the CEO be in the workshop? It is critical to have anyone with the power to scuttle the process present in the workshop to make the Brand Pyramid more than just a pretty piece of paper. If this is not possible, the project may fail. If the Brand Pyramid is not sanctioned or endorsed by leadership, it will be little more than an interesting exercise. Q: How do I get my CEO to participate in the workshop? First, share the video promo on this page and ask them to watch the 15-minute introductory video, which can be accessed for free here. If this is still not enough, we are happy to get on the phone with you and your boss to answer any questions you might have. Call us at (718) 522-6326 or email info@tronviggroup.com to arrange this. Q: Is there a standard invitation letter/email I can send out to describe the workshop and invite attendees? We will give you a sample template based on your particular situation. This follows the first consulting call.